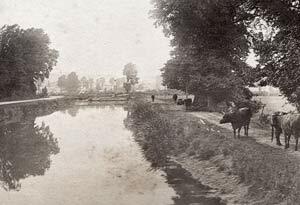 A 19th Century photograph of the canal posed a puzzle as I could not identify the bridge. A 1930s map showed Seage's Swing Bridge at a point that seemed to coincide with the bridge in the photo. 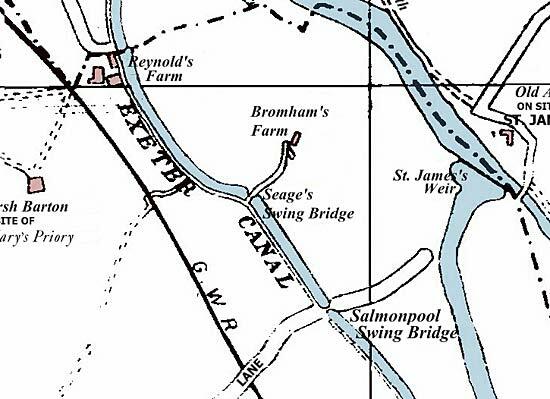 The map indicates the bridge gave access to Bronham's Farm to the east of the canal. It is difficult to know when the bridge was constructed, but it is known that James Green replaced the Countess Wear swing bridge in the 1820s and it may be then that he added Seage's Bridge, if it was not already in existence. The first reference in the Flying Post to Seage's Bridge was in May 1880 when the Navigation Committee discussed the possibility of removing the bridge as its height above the water was only 3ft 7in, requiring it to be swung open for all but the smallest of boats. At the same time they were going to widen the canal at that point, as the bridge was on a bend and navigation could be awkward for large vessels. During a Navigation Committee meeting in which the surveyor reported on the dredging of the canal between the basin and Seage's Bridge and on to the Double Locks using a steam dredger. By 1884 a steam tug had been introduced and the canal at Seage's Bridge needed to be straightened to aid navigation. Plans and an estimate of the cost were ordered. The next year the Surveyor's plans were presented to flatten the curve and to widen the waterway from 29 ft to 33 ft 6 inches. It was also intended to replace the bridge with a new iron lattice girder swing bridge at a total cost of £395 – it was recommended that the work be done. The last mention of the bridge during the 19th Century in the local newspapers was in 1895 when the Flying Post reported that the pier of the bridge had sustained some damage by a vessel passing up the canal. Some stones were dislodged. It was intended to lower the water in the canal to aid the repair work, but it was postponed for a few days because of the amount of traffic on the canal. The bridge was discussed by Exeter City Council during 1950 and the City Surveyor recommended removing it at a cost of £400. The intention was to improve the canal so that ships of 180ft rather than 160ft in length and with a a 30ft beam rather than one of 25.5ft could access the basin. There are no council minutes noting the removal of the bridge, but it appears that it was removed sometime after. In 1955 the canal was closed to enable the abutment to be removed, thus widening the bottleneck. Seage's Bridge continued to be included on maps of Exeter into the late 1950s – it is probable that the council was using up its old maps before having it redrawn. Seage's Bridge is an example of how quickly after a structure is removed that the locals forget its existence. Source: National Archives and Trewman's Exeter Flying Post. This photo, taken from the Salmon Pool Swing Bridge shows Seage's Swing Bridge in the distance. Click to enlarge.